AMERICAN CANYON, Calif. -- It's the kind of place that could drive you to drink. It's not uncommon for the views to leave folks feeling thirsty as they finish their round at Eagle Vines Vineyards & Golf Club. Some of the most memorable holes at Eagle Vines Vineyards and Golf Club in Napa Valley are bordered by rows of grapes, and it's not uncommon for the views to leave folks feeling a bit thirsty as they finish their rounds. From the fairway at the opening hole to the green at No. 18, you can often see vineyards for miles in every direction. And as one of the only golf courses with its own private-label estate wine, you should stick around to sip a glass of scenery after your round. "We hear mainly about the beauty of the property. 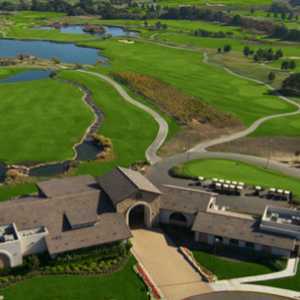 It has 40 acres of vineyards," said Michael Stirling, director of golf at Eagle Vines. "From May through November, the leaves and grapes are growing. After harvest in September, the leaves turn to fall colors and give the course a whole new incredible look." If you taste a trace of Titleist or smell a hint of Srixon in your post-round refreshment, there's a reason for it. While most wine country golf courses are either leasing their farmland or selling their grapes to producers, the owners at Eagle Vines, which is located about five miles south of Napa in the rolling foothills, are actually bottling the fruits of their labor. There's already a Chardonnay that features the flavors of the third and fourth hole, while the crop you can spy from the 17th tee is being corked as Cabernet. 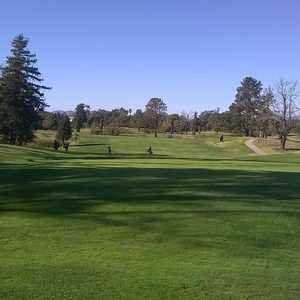 The fairways at No. 13 and No. 14 are framed by a future shipment of Sauvignon Blanc. Like most fine wines, Eagle Vines is a mixture of a few different flavors. Nine holes were designed by Bay Area-based architect Algie Pulley in the late '70s and originally belonged to nearby Chardonnay Golf Club, while World Golf Hall-of-Famer Johnny Miller helped draw up the others in 2003. The finished product is a 7,297-yard layout with wide-open fairways, challenging approaches and large, topsy-turvy greens. The highlight for most is the signature sixth hole, which measures 163 yards from the back tees to the middle of an island green that appears to be about the same size as Alcatraz, the prison-turned-museum about an hour down the road that ranks as one of California's top tourist attractions. With all sorts of slopes, the putting surface might remind you of San Francisco, too. Not according to James Peterson, a Colorado-to-California transplant who considers himself among the regulars at Eagle Vines and insists a roller-coaster putt still beats a pitch, flop shot or lost ball. "You don't have to be dead-on. The greens here aren't postage stamps, so it's a little easier to stay on and have a putt for birdie," Peterson said. "You have to be on the right shelf, but at least you have a chance. You're not chipping from the rough or hitting the green and then bouncing off. At least you're going to be rewarded with a green in regulation." Eagle Vines includes an irons-only range and short-game practice area, with instruction available. If there's a drawback to visiting California's Napa Valley, it's that the world-renowned wineries and tasting rooms are usually jam-packed. 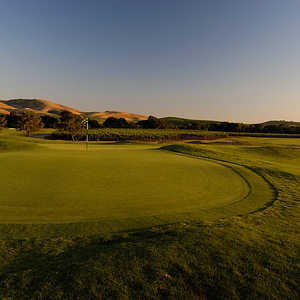 Although Eagle Vines Vineyards and Golf Club is a popular spot for tournaments and corporate outings, it can also be an ideal hangout for club-toting tourists hoping to escape from the crowds without missing out on the wine-country experience. Consider it an 18-hole, 237-acre vineyard tour for your foursome. "Being such a large course, there are no switch-backs. Each hole is uniquely its own," Stirling said. "I think the thing I find most most enjoyable is that you can play the course over and over, and there are so many different ways you can play it. It never gets boring." The Meritage Resort & Spa (www.themeritageresort.com) is located just a few miles from Napa's city center -- and even closer to Eagle Vines -- but it sits on the edge of the vineyards and is so quiet you might feel like you're spending the night in a farmhouse. Make that a modern, stylish farmhouse with a Tuscan-inspired restaurant on the main floor, a pool in the yard and a full-service spa on site. As a bonus, guests are welcomed to the Meritage with a bottle of Trinitas Cellars wine. And if you're still thirsty, you can sample more at an underground tasting cave also located on the resort property.